Perhaps Google gets it. Perhaps Google understands comics as a form of sequential art that can translate complex ideas through the combination of graphics and text. 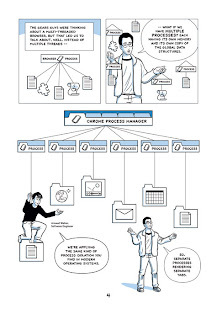 Why else would they tap Scott McCloud to create an intriguing new comic that explains the reasons behind the new Google web browser called Google Chrome? And why else would McCloud – who is a legend in the world of comics for such tomes as UNDERSTANDING COMICS and RE-INVENTING COMICS – agree to take on such a task if he, too, didn't understand that the translation of the rationale behind another new web browser would reach an extended segment of audience if it were put into the form of a comic. The comic provides an explanation of what went on behind the scenes as developers were imagining and creating a new web browser. By using the sequential art, McCloud shows as well as tells the thinking of the engineers, from the initial ideas of Chrome to the way Google is using an Open Source platform to improve its web browser. I am not advocating the download of Chrome here (heck, I haven't even gotten that far) but I do think the use of the comic here is powerful and in the classroom, this comic might be an interesting way to introduce some of the thinking at a company like Google that has teams of engineers developing new products all the time. And in this case, they thought about the weaknesses of traditional browsers and came up with possible ideas to improve an idea (while continuing to secure its dominance on searching the Internet via Google). A marketing class, in particular, might have a field day with the question: why a comic?